Manga Entertainment have been doing a lot right recently. As well as obtaining the rights to the ultra-popular Naruto they have also teamed-up with artist Terratag to produce some exclusive Tetsujin 28 products in preparation for the UK release of the live-action film later this year. One of those products is this excellent t-shirt. The line-art approach of this t-shirt give it a real dynamic look and the robot theme should appeal to non-anime fans as well. Not only does it look great, it also feels great to wear as well, feeling just right and not to baggy. 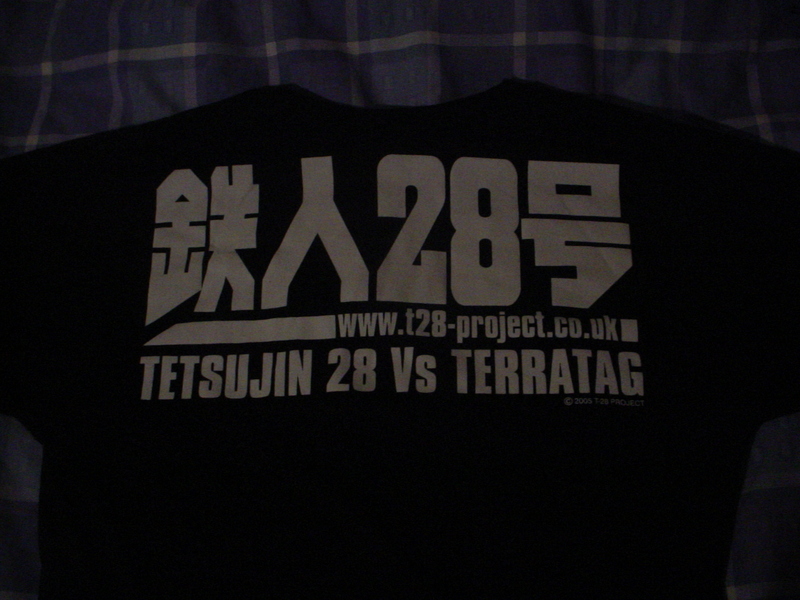 The backprint looks as good as the front as well, as big Japanese writing is always good. Some may be less keen about the website address on the back, but the quality of the artwork far outweighs this. A robot fight and Japanese lettering - what more could you want? Although these were very limited, it is well worth regularly checking Terratag's site by clicking here. The limited runs are frequent but can sell out quickly as they are popular amongst anime fans, particularly the many Gundam designs.